Exquisite malas, made from sacred rudraksha seeds, steeped in tradition, full of contemporary beauty and bliss. indfulness is a popular buzzword in America today. Did you know there is a magazine called Mindful? And there are conferences and festivals about the subject, as well as mindfulness-based stress reduction classes? If we lived in Texas, we could visit the Austin Mindfulness Center. Even Target, Google, and Ford have started teaching employees mindfulness. Mindful employees, research proves, are healthier and more focused. So why has mindfulness gained so much traction recently? Over the past several decades, we’ve seen widespread acceptance and enthusiasm for many ideas and practices of Eastern traditions into Western culture. Yoga is one such practice. Mindfulness is another. It also works. Researchers are uncovering the health benefits of mindfulness—being aware and nonjudgmental of what’s happening in the present moment. For me, mindfulness can be Buddhist mindfulness elusive. How about you? Practicing practitioner Thich mindfulness on the mat is easy, Nhat Hahn describes but how does one go about it as we mindfulness as “the make our way through the hectic energy that helps us to schedule of our lives? From eating be there 100 percent. and spring cleaning, to relationships (It is) the energy of and parenting, this issue offers you your true presence.” great insight and tips to attaining mindfulness. If you’re a busy woman like me comfortably multi-tasking much of the time, I highly recommend The Mindful Woman. Written by Sue Patton Thoele, whom I regard as my mindful guru, she’s incredibly smart but also super down-to-earth and relatable. You’ll find other books on mindfulness on page 19. For our cover story, we caught up with thirteen parents who speak about the virtues of mindful parenting. It is heartwarming to see their commitment to really savor and appreciate their children’s presence for the extraordinary gift that it is. Whether you are new to the practice of mindfulness or are already familiar with its gifts, we hope you enjoy this issue. Send us your comments or feedback at editors@yoga-iowa.com. We’d love to hear from you. Happy Spring! A warm welcome to our newest field editor, Sheila O’Laughlin, who has lived in Dubuque since 2007. She is certified in Forrest Yoga and has been practicing yoga for almost twenty years, starting at Sivananda Yoga in Chicago from where she hails. You may have seen Sheila in her past life at the courthouse in Dubuque where she practiced law, and more recently as president of the Julien Dubuque International Film Festival taking place during April in Dubuque. Leaving chronic headaches and the corporate world behind, Lisa Acheson, RYT 500, has yoga to thank for her new life of ease. Lisa is a Level 3 Certified Adamantine® Yoga teacher, sharing this practice in the Beaverdale neighborhood in Des Moines, IA. Visit lisaachesonyoga.com. Charlynn Avery, is an aromatherapist and educator for Aura Cacia (auracacia.com), a registered brand of Frontier Co-op. She travels the U.S. teaching safety and effective essential oil use. She has degrees from Iowa State University, the Carlson College of Massage Therapy, and the Southwest Institute of Healing Arts. Val Brown, RYT 200, is a certified Relax & Renew restorative yoga teacher and the Social Media Manager for Maharishi Ayurveda Products International (mapi.com). She is pursuing an Ayurvedic Wellness Consultant Certification through Maharishi University. Val recently learned Transcendental Meditation, and looks forward to a lifetime of practice. Sheree Clark, M.Ed., AADP, CHHC, is a holistic health and nutrition expert with a private practice she calls Fork in the Road (fork-road.com). An inspiring author, television show host, teacher, motivator, and raw vegan chef, Sheree works with clients to help them get the most out of life by improving their health. Eric McCabe is a Zen Buddhist priest teaching meditation, yoga, and calligraphy to people from all walks of life. He undertook a 15-year apprenticeship in Pennsylvania and also trained in Japan, France, California, and Nebraska. He lives in Ames and is presently working on a book about his Zen temple life. Visit him online: zenfields.org. Linda Garcia, RYT 500, is a master level facilitator of the Amrit Method of Yoga Nidra. Linda teaches Gentle Yoga and Yoga Nidra at her home studio in Des Moines, and is available for private lessons, studio workshops, corporate trainings, yoga retreats, and festivals. Contact her at linda@garcia.org. Shannon Moran, E-RYT 200, is the co-founder/co-owner of Indigo Wellness Studios in the Quad Cities of IL/IA with his wife, Abby. With three studios, a teacher training program, three children, and four parrots, life is busy, but Shannon maintains a devoted yoga practice six days a week. Visit indigowellness.info. Carrie Ellen Giunta is a certified Viniyoga teacher. A professional singer by trade, she offers her love of sound and breathwork in her yoga teaching. She currently offers Therapeutic Yoga for Common Aches and Pains at Santosha Yoga in Urbandale, IA. Please visit SIT Yoga on Facebook, SantoshaYogaDSM.com, or Viniyoga.com. Renee Posner is VP of Marketing for Maharishi Ayurveda Products International (mapi. com). She has a biology degree from American University and studied physiology at Georgetown University School of Medicine, providing her early foundation in health and critical thinking. She also teaches Transcendental Meditation, which she has practiced for 35 years. Linsey Birusingh is a 200-hour registered yoga teacher, and a television host, journalist, and founder of the yoga adventure business, Yoga Thrill (yogathrill.com). She recently trained to teach traumasensitive yoga though Kripalu Center in Massachusetts with hopes of helping restore joy and peace in people who’ve suffered trauma or abuse. Angela Sands is certified meditation teacher who joyfully teaches anyone with a desire to learn. Creative and curious, she is wholeheartedly engaged in a courageous journey of self-realization as she is fully committed to guiding people on the most exciting adventure of all: the journey inward. Visit her online: cloudninemeditation.com. Cultivating Mindfulness on the Mat MOVE BEYOND ASANA TO THE NEXT STAGE OF A MORE THOROUGH PRACTICE BY RUTHANN O’BRIEN HADISH We live in a society that values “doing.” From the time we’re put in school there is always something to accomplish, a goal to reach. Once we accomplish one task, it’s on to the next. It’s no wonder the processoriented practice of mindfulness can be elusive, even disorienting, as the mind searches for something to grasp. The practice of yoga is directly connected to mindfulness. Practicing mindfulness during asana is essential to nurture the higher aspects of yoga for profound transformation. From this place of self-awareness, we can then begin to drop the storyline of the ego based in goal-oriented ambition. Mindfulness practice is simply a way to observe what arises moment by moment without judgment. When we’re on the mat, we can rely on the breath as an anchor to conscious asana practice. Breath awareness can then connect us with sensations emerging in the body and mind in the moment. Instead of reacting to what we’re experiencing, letting ambition take control, we develop the practice of silent witnessing by observing the sensations just as they are. For example, you’re standing in Utkatasana, or Chair Pose. As you hold the pose, you notice your thighs burning, your shoulders holding tension, and your breath becoming labored. You react by tightening, anticipating the exit. This leads to agitation in your body and mind. YOGAIOWA IS DISTRIBUTED QUARTERLY THROUGHOUT IOWA. 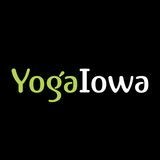 YogaIowa is available free of charge at Iowa yoga studios and more than 400 locations throughout central Iowa. To order an annual subscription delivered to your door, please send $15 to Subscription-YogaIowa, 522 NE Georgetown Blvd., Ankeny, IA 50021. For changes of address and other inquiries, contact us in writing at the address above, or subscriptions@yoga-iowa.com. 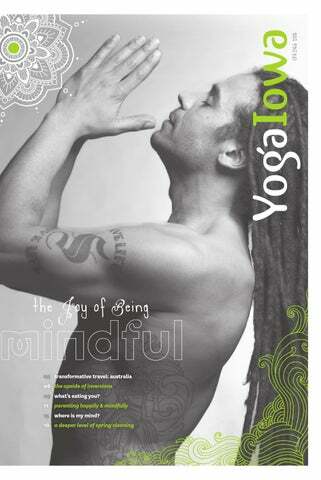 To request delivery to your business, contact editors@yoga-iowa.com. Now, imagine you’re in the same pose, experiencing the same sensations, having similar thoughts. This time instead of reacting, you simply observe. You remind yourself to let go of the storyline, breathe deeply, and witness the ongoing sensations with awareness. Mindfulness during your physical practice includes this process of simply noticing what emerges without clinging to or changing any of it. The key in this conscious state of presence is to extend an acceptance and friendliness toward these sensations. The ancient yogis practiced pratyahara–the ability to move your awareness inward toward remembering the true self. In turn this allows your true self to unfold. In the Yoga Sutras, Patanjali noted, “When the senses do not conform with their own objects but imitate the nature of the mind, that is pratyahara.” The practice of mindfulness in asana supports the shift from attachment to acceptance, bringing your awareness full circle as you remember to surrender to what is. As we awaken to the divine within, we rest with clarity into the true nature of our mind and heart: our natural state of joy. BY TRACEY L. KELLEY Australian Aborigines believe in The Dreamtime: a beginning that never ends, a connection between the physical, spiritual, and human. An Aboriginal person who is on walkabout reawakens her awareness of culture, sense of place, and belonging, simply by leaving what is known and embracing the unknown for a time. A walkabout is not, as some people might believe, an aimless activity, but a chance to escape everyday life and reconnect with the natural world, with loved ones, and with self. My husband, Matt, and I celebrated our twentieth anniversary in December 2014 during three weeks of adventure in the land down under, with some stops certain, but most left to our imaginations. This trip was especially important to me after weathering a corporate layoff, venturing back to college full time, and managing financial and health struggles. I felt weighted down by the past and thrust into the future without a true understanding of my current being. I needed to be, as is often said in yoga, more present but lost definition of what that meant. We motorized our walkabout, traveling the country’s east coast between Sydney, New South Wales, to Cairns, Queensland, and back—a distance of approximately 5,000 kilometers, or about 3,100 miles—or the equivalent of driving roundtrip between Des Moines and Miami! Australia is a land and a culture seemingly familiar yet oddly different. Similar to the US, it’s a vast country with an ever-changing landscape: lush mountains, arid bush land, and striking beaches. Yet from Woolgoolga to Munduberra, as motorways suddenly narrowed into village streets, then opened up again, random encounters prompted a fresh perspective: Feral camels grazing in harvested sugar cane fields; rounded century-old pub motels anchoring street corners; eucalyptus groves releasing a heavenly scent during thunderstorms; unmanned mango and banana stands with canning jars to accept an honor-based payment; koala bear road crossing signs; footprint labyrinths carved in concrete marking an ancient tribal journey; and urban families frolicking on sandy beaches built in the heart of city centers. each day is unfulfilled unless it has the right mix of fresh air, friendly company, and good-natured fun. Many Australians we met hold responsibility and soul-filling experiences in both hands. They believe each day is unfulfilled unless it has the right mix of fresh air, friendly company, and good-natured fun. Whenever I was asked, “How ya’ goin’?”—an Aussie version of “How are you?”—it prompted more hope that I would regain my inner compass, balancing new responsibilities with mindful presence. Breathing astringent ocean air and gazing at a shifting blue meridian between water and sky always soothes me, so visiting different beaches every day was a welcoming balm. At Coogee Beach in South Sydney, on the last afternoon of our trip, I ventured into the surf one more time to watch scuttling sand crabs and search for another nautilus or bit of pastel sea glass. As the waves buoyed me back and forth, I felt an awakening, a heightened sense of absolute connection and peace, and my heart swelled. The walkabout was complete. tion, curiosity, and openheartedness, and recognition that these three things are essential to my wellbeing. •	Various touchstones such as roc ks, shells, and sea glass that help ground me to a particular point of presence. •	My true north which, by happen stance, had to be found in the southe rn part of the world. are two, both of which exemplify the incredible hospitality we experienced from Australians. The first: an intima te Christmas day luncheon of native delights with our lodging hosts in Cairns and their friends and family from Englan d and South Africa—a languid afternoon on the lanai of their home overlooking a crystal blue cove. The second: a massive out door New Year’s Eve multicultural dan ce party arranged by our dear Sydney-based friend, Jack, at the Museum of Conte mp orary Art Australia on Darling Harbor—a raucous celebration with midnight fire works illuminating the iconic landmarks of the Sydney Opera House and Harbo r Bridge. have a yogic trip to share? Just $15 a year! YogaIowa is the leading voice for yoga, holistic health, natural living and spirituality in Iowa. Lena Fox meditates in Des Moines’ enchanted Greenwood Park. ince Lena Fox began meditating a year ago, she’s fallen in love with her perch upon an old bench in Des Moines’ enchanted Greenwood Park. “I have one room in my house dedicated to yoga and meditation, but I love to be with nature.” Though it’s more convenient to practice in her own backyard than the park, her neighbors can be distracting. “One asked me what I was doing!” she laughs. So how do you create an ideal, outdoor home meditation space? Certified meditation teacher Jules Green of Ankeny says there are absolutely no external must-haves for your calming oasis because the power of meditation comes from within. Still, there’s no reason you can’t dedicate a space to show your commitment to your practice or personalize it, making a place you yearn to frequent. First, find security. “A safe feeling is paramount. You can meditate anywhere you feel safe to close your eyes,” says Green. For Fox, and a beginner like me, that might mean fostering some solitude. Tara Dudley, landscape designer and owner of Plant Life Designs in Des Moines, says a lattice screen is a costeffective way to do just that. “If you’re up for some landscaping, plant trees with shielding canopies or tall bushes.” Dudley has plenty of budget-friendly tricks to employ if you’re ready to get more elaborate. “Start by thinking about your journey to your space. If you can, lay a long, meandering stone path to get there. We’re always in a rush, and a path prompts us to slow down and appreciate what’s around us.” Dudley encourages clients to keep a simple horticultural aesthetic for focus. “Use as many plants and flowers as you want, but only use three-to-five varieties. Choose plants with calming scents and a cool color palette, such as lavender, which also makes a nice border plant. Even when it’s not blooming, it has beautiful silvery-green leaves. Herbs are also easy to grow and smell awesome.” One thing Dudley wouldn’t add is roses. Hybridization for better length and bloom has taken away their once alluring scent. Most meditations encourage a comfortable seat. If you don’t have existing seating to repurpose, Green says to experiment. Consider an all-weather floor pillow, a garden bench, or a stone bench. Finally, add any personal touches like the ones Fox keeps in her meditation room: a gift from her son, an inspiring quote, shells from vacations, even a spiritual relic. Keep it personal, keep it simple, and it will be a place you’ll keep coming back to until first frost. the up side of inversions PRACTICING INVERSIONS HELP YOU CONQUER FEAR, REVERSE THE EFFECTS OF GRAVITY, AND ENDOW YOU WITH A NEW PERSPECTIVE BY TRACEY L. KELLEY With each advance in a yoga practice, new challenges simultaneously thrill and intimidate us. Inverted postures represent pillars of stamina, fearlessness, and clarity in a sequence, and are often the essential poses many practitioners aspire to master. Jeani Mackenzie is the founder and director of the Davenport School of Yoga. She says inversions set yoga apart from other physical disciplines. “Psychologically, they allow us to see things from a different perspective. Emotionally, they guide the energy of the pelvis toward the heart center, enabling self-exploration and inner growth,” she says. “And physically, inverted postures stimulate the immune and endocrine systems, thereby invigorating and nourishing the brain and other organs. According to some yoga scriptures, inversions stop the aging process—as long as you are upside down, you are not aging.” Evan Harris is the co-founder of tapas yoga shala in Rock Island, Illinois. He says everyone can benefit from inverted postures as well as inversion as a quality. “Classic inversions include Shoulderstand, Headstand, Forearm Balance, and Handstand, plus innumerable variations of each,” he says. “These postures work the whole body. Inversion as a quality—the head physically lower than the heart—also appears in a wide range of postures. In this way, yoga practice involves going in and out of inversion over and over again. For example, Sun Salutations move you in and out of inversion virtually with each change in the direction of breath.” Mackenzie encourages practitioners to increase upper body strength and flexibility to establish a strong foundation for inversions. “To change your relationship to gravity, first build from the ground up,” she says. “For example, Chataranga, when practiced with attention to alignment, becomes the ideal training for Headstand, Forearm Balance, and Handstand. It creates stability in your shoulders, a sense of compactness at your center, and alertness in your legs—all critical for doing safe inversions.” Mackenzie and Harris agree that working with a certified teacher at various stages of your inversion practice increases ability. “It’s fine to experiment with inversions independently. Yet there are common mistakes in where and how to work these postures so they become lighter and easier, rather than overworking and increasing stress and strain,” Harris says. “Your teacher can quickly diagnose and remedy these issues. Also, in my experience, moving away from the wall into Headstand or Handstand is a process that is greatly helped by a teacher.” Mackenzie adds that your work with inversions should be inquiry-based, rather than replicating what someone else is doing. The contraindications for inverted poses should be taken seriously. Both Mackenzie and Harris caution people with high blood pressure, glaucoma, and neck injuries to use modifications of classic inversions instead of doing the postures in full expression. They also agree that each woman should decide individually if inverting is appropriate during menstruation. GETTING A GRIP ON EMOTIONAL EATING BY SHEREE CLARK ood is an undeniably emotional topic for most people. When we were young it was often used as a reward (“Good job! Let’s go out for ice cream”) or as punishment (“No dessert for you, you didn’t eat your spinach”). As adults, food is a focal point of just about every gathering from birthdays to funerals. Could you ever imagine inviting someone into your home and not offering something to eat or at least drink? As a result of all the emotional layering around food, many of us have forgotten how—and really even why—we eat. Animals in the wild know that food is nourishment: it’s essential to their survival and that’s that. Animals do not eat for recreation, reward, entertainment, or to numb out, and their food does not replace the approval they never got from their caretakers. When you start to change to a healthier way of eating, one that includes lots of fresh, healthy food, items that are emotional “go-to” foods have pretty much been eliminated from your diet. Gone is the double-cheese pizza, the side of fries, the chocolate lava cake. As a result, it’s very possible you may at times feel deprived, cheated, lonely, and just hungry for...well, something. What you’re experiencing is an awakening, a reconnection with your true self. Without the distraction of food, you’re essentially experiencing emotions and thoughts that may very well have always were there; they were just hidden under the veil of food additives, added sugar, and perhaps merely larger quantities. Here are a few guidelines to help you stay the course. Whether you’re currently having cravings and emotional swings or you’re happily sailing along in a program that is working for you, pay attention. You may even want to post your own version of these strategies in a place where you’ll be reminded of them daily. Food is meant to be enjoyed and savored, not devoured in record time. This exercise will help you remember to be mindful and to engage with your food. Mindful eating: an exercise to get you started Pick three simple foods with contrasting flavors: a tiny piece of dark chocolate, a teaspoon of almond butter, and a kalamata olive; or a raisin, a small strawberry, a sliver of flax cracker. Sit down with these less-than-bite-sized samples and look at them. Pick them up, one at a time. Taste them with your eyes, then by smelling. Rub them on your lips. Smell again, and finally allow each one of the food samples a turn to enter your mouth. Make the three samples last as long as you can. newspapers and books, sporting events, and driving. Whether you’re having a meal or a snack, just eat. This practice allows you to gauge when you’re full and it’s time to stop. It also means you get more enjoyment from your food because you’ll be truly present. Eat what your body wants. Yes, what your body wants, not your mind. To get an accurate assessment, you have to slow down and be honest with yourself. Your physical form doesn’t want chocolate covered potato chips; your head does. Nor does your body want you to eat until you are so stuffed that your pants dig in. Consider keeping a journal to see how eating certain foods makes you feel, especially if you are not familiar with the idea of giving your body what it needs. Blend together pecans, shredded coconut, dates, and chia seeds in a food processor until thoroughly combined. Transfer to a bowl and add remaining ingredients. Mix together with your hands until evenly incorporated. Place mixture between two pieces of parchment paper and roll out until about ½ inch thick, squaring the sides as you roll to form a rectangle. Cut into 16 pieces and refrigerate for 4-6 hours. ’m a sucker for those “regrets of the dying” lists that circle the Internet. Imminent death has a way of revealing precious jewels of wisdom, and I always love to hear what wisdom has to say. It turns out the regrets of the dying revolve around one thing: relationships. Whether it’s not honoring their own personal dreams or wishing they spent more time with their kids, the regrets of the dying reveal that relationship with self and others is what matters most. The most So why are relationships so difficult to master? fundamental and I’m not a psychotherapist, sacred relationship counselor, social worker, we have is the one doctor of any kind, or selfwith our self. professed relationship expert. I’m a meditation teacher who knows a little bit about a big subject called mindfulness. Mindfulness is paying attention to what is actually happening without labels, stories, or judgment. Mindfulness is easy to understand but not so easy to do for more than a few moments, especially in relationships. If we can employ mindfulness within our relationships, we have a shot at mastering them. The most fundamental and sacred relationship we have is the one with our self. Unfortunately our self is the first person we tend to fail in terms of a mindful relationship. We are quick to judge our self, talk negatively to our self, and withhold love and acceptance from our self. Our attention is everywhere but in the present moment. We are busy grieving over the past or speculating about the future to the point that we aren’t experiencing our life, but rather a story about our life. We have disconnected from our true self and feel lost. This makes us sad, anxious, and unhappy, so we go looking elsewhere for our true self. One of the places we can look is in relationship with others. Relationship with others can be the perfect playground for personal growth and discovery. In my experience, bringing mindfulness into relationships fosters rich and meaningful connections and allows space for amazing experiences to unfold naturally. It has the added benefit of reminding me who I am and what I really want. I get to know all kinds of people, including myself, while having a great time! Sign me up! But before I practiced mindfulness, I was often triggered by the behavior of others. A relationship that isn’t employing mindfulness is often filled with battles between what is actually happening and what we wish was happening; filled with stories about how things “should” be instead of noticing how things are; filled with scorecards and blaming; and filled with a lack of attention for the other person. These kinds of relationships can result in resentment, anger, and victimization, and are destined for the regret list. Putting mindfulness to work in a relationship with our self and others requires three main ingredients: •	paying nonjudgmental attention •	communicating desires •	being open to receiving but not attached to outcome Mindfulness doesn’t eliminate challenges that will inevitably show up. It keeps us from being swept away in the heat of the moment and gives us space to make nourishing choices, not knee-jerk reactions that take us off course. The mindful relationship mines what is already here in the present moment. It reveals what is most precious to us, so we don’t have to wait until we are dying to discover it. molly schreiber Des Moines, Iowa • Teaches yoga at Shakti Yoga Shop, FIT, Goals in Motion Fitness Studio, Forté, Moberg Art Gallery, and I Work & Play • Three children, ages 9, 6, and 3 Mindful parenting is having a connection with my kids and allowing them to see me for who I am. I use myself to set a good example for them. They see me connect all day with people and share that connection through normal human interactions, such as making eye contact, which improves the quality of that interaction. It’s also why for the past three years I’ve started all classes by asking students to hug the person next to them. I try to limit technology both personally and in our home. It’s a poor substitute for the real thing and can be a big hindrance on mindfulness and interpersonal relationships. In our household I try to keep the level of mindfulness real, true, and natural and let my children be themselves and let them see me as my true self. “Maria, time to get your pajama’s on.” Five minutes pass… “Maria?” “Mom, look what I made!” I walk into the bedroom to see a beautiful display of stickers, poster board, markers and duct tape. I see a mess! What do I do as a parent? I pause, I take a deep breath, refocus my thinking and speak. I sit next to her and speak. “Tell me about it, Maria.” There are so many ways to react as a parent in our busy world. We have many demands and distractions, as do our little cherubs. To me, mindful parenting is taking a step back, seeing the big picture of what’s really important, and letting go of expectations. Being in the moment with our loved ones is the greatest gift we can give our families and ourselves. Pajama time can wait ten minutes when we have the opportunity to be in the present moment with our children. HOLY YOGA I found yoga when I was 24. I was lucky. I found it in a book and not in a studio. Yoga classes were all but non-existent in the Midwest in the early 90s, but the pseudo-religious studio scene was already alive and well in NYC and on the West coast. I began practicing simple postures and slowly the discipline revealed itself. Through yoga I learned an ethic for living a happier, healthier and more spiritually-grounded life. But it wasn’t the eastern religious element that changed me. It wasn’t chanting to Shiva, or saying Namaste. I didn’t adopt a spiritual name or become a Buddhist. The yoga practice itself changed me. Nothing more. It was the movement, the power of the breath, and the lessons I learned while on my mat that permanently etched themselves deep into my heart and taught me how to be a better person. Join us for a weekend of yoga with one world’s most innovative and insightful yoga teachers. Register early, space is limited. I believe there is a universal cognition to movement and breath that transcends culture or religion. Movement is not Hindu, it’s not Buddhist, and it’s not Christian. It is a language of the human body, and there are truths that can be discovered in your daily yoga practice that are as profound as any uttered by the prophets or the sages. Yoga is for everyone. I can’t think of anyone I know who wouldn’t benefit from a personal practice. But the cultural and religious remnants of its Indian origin can create barriers. And the message many people are encountering in yoga is that it’s religious. But you don’t need to do holy yoga to make it work. Adamantine® Yoga offers an authentic, experiencebased system that anyone can access, regardless of belief system or cultural background. My sincere wish is that through this approach many more people can find their way to the practice of yoga, and that together we can co-create a happier, healthier, and more spiritually grounded world. nessa doria Urbandale, Iowa • Yoga instructor at Lifetime Athletic, Fitness by Design, and Powerlife Yoga Two children, ages 12 and 10 Mindfulness is a constant practice, first introduced to me while taking my RYT 200 classes over four years ago. I believe mindfulness leads to happiness: when what I think, what I say, and how I act are all in alignment. As a single parent, I know I can only control what I do and say in my own home. Translating that so my children understand is leading by example. Although we are not perfect, just like our yoga practice, we progress forward one day at a time. Every single night with my kids, we end the night with talking about one thing we are proud of, no matter how the day unfolded. We close our eyes and sleep knowing that a new day is coming with a chance to start all over with a new attitude and an open heart and mind. dana & ron robinson Iowa City, Iowa • Owners: Sweet Feet Yoga and Family Wellness Chiropractor • Three children, ages 11, 8, and 5 In our family, we are about being mindful of our whole selves—body, mind, and soul. We teach our kids to be mindful of how we treat our bodies and what we put into our bodies. Eating healthy, whole foods that make our bodies and minds feel good and work well is important, and our kids know why and how it feels if they do eat something not great for their bodies. We get regular chiropractic adjustments and practice yoga together as a family. The kids know how and when to use yoga breath, a pose, or visualization when they need it. It’s empowering for them to have these tools at their disposal! We also bring mindfulness to how we connect to others: in our family, our community, and around the world. We’ve taken our children to Kenya and served and learned right along with them. sandi & zachary hoover Des Moines, Iowa • Co-Owners: The Family Tree Yoga and Massage • Three children, ages 9, 6, and 18 months As I write this, our boys are wrestling balloons while our toddler “organizes” tea bags on the floor. In this moment, our house might appear in chaos, but this is just how I like it. Each family member is engaged and in the moment. We hold space for each other to experience whatever emotions we need to. We prepare and eat our meals together as a family, spend time daily outdoors and read together often. We speak to each other lovingly and avoid reacting. Our family motto is: Kindness-ConsiderationRespect. This way of parenting helps us live more simply and feel more connected to our kids, even amidst the chaos. mary avenanti Waverly, Iowa • Practice: Field of Yoga Project Seven children, ages 33, 31, 28, 25, 23, and 18 (twins) Mindfulness flowed effortlessly when my children were young. Seeing the world through the eyes of toddlers and preschoolers keeps a person grounded in the here and now. It seeped softly into our days filled with nature walks and garden time, endless hours of imagination and discovery. It shone magnificently in the stunning concentration of my three-year-old cracking an egg and in the remarkable focus displayed while constructing Lego homes for unsuspecting toads. Each of my seven children seemed innately aware of their place in the natural world, with hearts wide open to receiving whatever came next. Their current challenges—teens in crisis, career stresses, and becoming parents themselves— have demanded I make a more conscious effort toward mindfulness. My yoga practice often allows compassion for their struggles to flow unabated. I remind my children they are enough. I encourage them to choose love over fear. I breathe in their sorrow, frustration, trepidation, anxiety, and loneliness, and breathe out joy and lightness of being. Parenting for us is a mirror like no other with new depths of feeling and love, and the potential for unhelpful emotional reactions. Mindfulness helps us keep proper perspective. We have the “short view”: any given day, interaction, or moment is rich with potential and never worth later regret. And we have the “long view”: the precious, fleeting nature of raising children, that surrendering yoga practice for today to meet another’s needs is the practice itself. For us, the best way we’ve found to be accessible, transparent, and unambiguous in nurturing our child is to be present with him while also being present with our subjective space—the swirl of images, talk, and sensations inside. There is richness to family life that grows from the willingness to be present with those who stir up the most feeling. No doubt it’s a work in progress but a joyous one. When I consider mindful parenting, I think of not just being in the same room with my kids but also being in the present moment with them. I walk next to them, instead of in front of them, to ask their perspectives on recent events. While driving them to baseball practice, I hear their highs and lows of the day, instead of talking on the phone with my friends. But living in the moment with my children sometimes can be a challenge. My husband and I not only have three busy children, but one of my sweet loves has a host of extra needs. Some days I’m filled with grief for the milestones she will never meet. Mindful parenting can’t include running away. So practicing yoga, reading a faith message each day, and prioritizing meals made from naturally-grown food are ways that allow me to savor and, above all, appreciate my life with renewed grace. pauline tan Urbandale, Iowa • Owner: Spark Barre Pilates & Yoga Two children, ages 15 and 13 As a yoga teacher and studio owner, I wonder if people think my home is a peaceful and calm place. While those moments do happen (usually late at night), we’re also the family that snaps at each other as we run late and collapse into chairs at church. veola perry Des Moines, Iowa • Retired educator • Practice: Mathew Koder Yoga One child, age 28 For me, mindfulness began with a name. What’s in a name? I knew before the birth of my daughter, Vivette, that I wanted her to know she would be a special person in this universe, a “Very Important Person.” So, V.I.P. are her initials, and I wanted this to be a reminder for Vivette that she bears a name that requires much giving and receiving. Hard work, determination, trustworthiness, and gratitude are some of the values that I have worked to instill in her. I’m a very proud parent of V.I.P. and of what she has accomplished thus far. Just being there for her, no matter what, to offer her constant support, guidance, and love is what I practice every day. I inhale and exhale and say a prayer of gratitude. With our extended family back in Australia, mindfulness for our family as we share life’s journey means always being there for each other every day, along with all our imperfections, whether it’s helping with laundry, getting dinner started, sending a quick text message to let each other know where we are, or cheering at races. Our most mindful family moments are usually on the weekend or during vacations when we slow down and have no expectations. We can rest, enjoy really good food, and just talk and laugh at the crazy things our dogs do. Now as a mother, being mindful has enriched my family’s life. When my oldest had a terrible nightmare she asks me to sing her a lullaby. She says, “You know the smile song from yoga class.” Ah, yes the lullaby of “Om Namah Shivaya” by Wade Imre Morissette. It’s amazing all of the things she has learned from going to yoga classes, and I truly believe she has learned from my example of how to be the most thoughtful and truest version of her. She’s very attentive and aware of others needs and is already a great mother to her little brother. Being a mindful parent is the most important role we have. It requires complete and total presence. We try really hard not to bring work home as we want to be fully engaged with each other and our kids. We set aside cell phones and let the worries of the day take a backseat to our family. Family dinners are also a priority for us as they are a perfect way for us to bond and be fully present together. Overall our commitment to being mindful and present keeps our relationship with each other and our kids very strong. Des Moines, Iowa • Retreat leader/ yoga instructor at Des Moines YMCAs, Iowa Family Chiropractic, and Moberg Art Gallery • One child, age 7 months Mindful parenting has given new meaning to my life as a first-time mother. Every moment of every day is an opportunity for me to demonstrate a life lived fully and cheerfully. From the early morning hours of nursing, to evening baths and prayers, I am reminded by her laugh and her cries that this time is the most important. The television is turned off for a majority of our days; the cell phone and computer have their place and time; and the great outdoors brings a refreshing breath of joy to us both. I am blessed with the opportunity to be at home with my daughter, and although there are sleepless nights to test my patience, I am rewarded daily by the simple things that warm my heart and soul, such as seeing the smile and sparkle in her eyes when she sees her Daddy walk through the door after a long week away at work. n our culture there is a major split between mind and body. Generally speaking, the body gets treated one way and the mind another. We go to a gym to develop our body. We go to a classroom to develop our mind. The body is considered the physical: muscle, bones, ligaments, organs. The mind is generally located in the head and considered superior to body. But these two things are not separate, and treating them that way creates a dislocation between our thoughts and reality. Breath brings body and mind back together so our thoughts are more in alignment with reality. We can learn a lot about the body and mind from Zen Buddhism. In Buddhism, breath is referred to as the royal road connecting mind and body. According to Zen, there is no body separate from mind, and mind is not located only in the head. When someone in Japan says, “I’m thinking,” they point to their heart. So where is our mind? One perspective is that mind is in every cell of the body. Every cell of your body carries memory. This is why According to Zen, cognitive therapy, therapy that is based there is no body on thought, is often not enough for separate from trauma patients or victims of abuse and violence. The violence to which mind, and mind a person is exposed is carried in the is not located muscles in addition to his or her only in the head. thoughts and consciousness. Asanas are powerful because they can, if done When someone in with compassion, help someone learn Japan says, “I’m ways to gently hold the pain they are thinking,” they experiencing, rather than repressing it point to their in a self-destructive way, or expressing heart. So where it in another destructive way. Filling the body with breath and then is our mind? releasing the breath is a way to touch pain, and acknowledge its existence in a compassionate way. It does not guarantee the release of that pain. That’s not the only point of yoga. If we practice only in order to remove pain we will most likely be disappointed. This is not to say that we won’t feel better after a yoga session, but we also need to do asana practice for the sake of the practice, for developing mindfulness or awareness simply of what is—not for the goal of gaining something or getting healthier. Greater health is important, but it is a byproduct of practice. In Buddhist practice we first use the breath to regulate mind and body. We calm the body and mind with the breath. This is the first half of the practice. Starting with breath allows the practitioner to recognize how everything is connected and interrelated, which is the second half of the practice. Using breath to calm down is for the service of gaining insight into Buddhist teachings on emptiness, the teaching that there is no separate self that exists apart from anything else. Deepen your Spring Cleaning BY CHARLYNN AVERY It’s spring cleaning time, and while you may be beating rugs, scrubbing floors, and opening windows to freshen your physical dwelling, you could likely use a new perspective on this seasonal rite. Spring cleaning creates a healthy home, but when done with intention and a connection to nature, it can also refresh our interior mental spaces. This is the ideal time to let go of all that is blocking your mind, body, and spirit. Try purging the cerebral clutter and clearing your psychological cobwebs while you’re sorting your old wardrobe and dusting the furniture. Clarify your mind and let a fresh perspective stream in while you’re washing the windows and deodorizing the airspace with these cleanconscience mantras and use of essential oils in the recipes below. Go about your cleaning with a new mindset. You are creating a wholesome, sacred living space after all, so don’t stress out. Turn your effort into a moving meditation that drives away despair, frustration, anger, and resentment. As you clean, softly chant “om clarity om” and visualize all negativity being banished from your internal and external spaces. When your cleaning tasks are done, enjoy and bless the nourishing environment you’ve created. Walk through your refreshed home and softly chant “om serenity om” as you visualize the energetic positivity, happiness, and love streaming into your internal and external space. Clear Negativity Mantra In order to attain peace of mind, one has to blow away the mental fog and reach a state of inner clarity. A clear mind, unobstructed by negative thoughts or troubling distractions will set the stage for a sense of peace and calm to flow in. MIST Cool peppermin t is clarifying, sw eet orange is up and patchouli is lifting, calming and peac eful. Combined in a body mist of fresh water, thes e oils provide a physical applicat ion that’s a men tal wake-up call attaining a clea to r, peaceful state of mind. 10 drops peppermint esse Combine th 20 drops sweet oran ntial oil ge essential oil a spray- e ingredients in mist bottle, shake 4 drops patchouli es sential oil vi go ro us ly , and apply 4 ounces water misting to your fa a light ce and surrounding ai , neck, rspace. We are mother/daughter team dedicated to your wellness. Call for an appointment today. bines This essential oil blend com ender, ling, coo Combine sweet almond oil, lav th the contrasting effects of Wi m. pal soothing, and spearmint in your clarifying spearmint with into fingertips, apply and massage a ne spi calming lavender to create the your temples and along mesmerizing balancing b Ru m. niu at the base of your cra r ove m effect. The minty freshness the cup your hands together, on ma aro will clear emotional the your face and inhale nts, tension while the soft, three counts, hold for three cou ma ile aro wh l nts ora herbal-fl and exhale for ten cou m. of lavender ushers in meditating on clarity and cal deep relaxation. Individuals are characterized by doshas: three distinct classifications for your primary body/mind makeup, or prakriti. The doshas are Kalpha, Vitta, and Pitta. This is where your holistic self-knowledge begins. Times of day and the seasons are also characterized by doshsas. Spring is Kapha season. While the earth begins its renewal, the influences of the season may be felt by those with primarily Kapha dosha. We may feel sluggish, lethargic or sad, and have trouble sleeping or waking up. We may be prone to respiratory issues or indigestion. However, the weightiness of Kapha isn’t all bad. It is also responsible for your sweet, stable temperament, longterm memory, strength, stamina, and sound sleep. Aware of our prakriti, we understand our physical and emotional nature. Being aware of our dosha imbalance, or vikriti, as it starts, we can take steps to bring ourselves back into balance. Learn about your own unique combination by taking the dosha quiz at www.mapi.com. People with primarily Kapha characteristics can follow a Kapha-pacifying diet. Add seasonal foods to your daily diet. Favor light, dry, and warm foods that are easy to digest: •	Fruit: apples, berries, and peaches •	Vegetables: asparagus, Brussels sprouts, and leafy greens •	Grains: barley and millet Reduce heavy, oily, and cold foods, as these increase Kapha. Reduce or avoid red meat, processed and canned foods, coffee, and alcohol. And of course, drink plenty of water! Daily water consumption will help your body flush toxic buildup, or ama. Get out and enjoy the fresh spring air and increased sunshine. Feel alive with vigorous exercise, a little each day. Yoga asanas that fire you up and make you move will also help with digestion and elimination, as well as opening up the chest and lungs, helping with congestion. •	Favor uplifting, heart-opening backbends such as Bhujangasana, or Cobra pose; Dhanurasana, or Bow pose; and Ustrasana, or Camel pose. •	Delve into invigorating inversions such as Salamba Sarvangasana, or Supported Shoulderstand; and Salamba Sirsasana, or Supported Headstand. •	Soothe yourself with digestion-stimulating poses such as Navasana, or Boat pose; and Apanasana, or Knee-to-Chest pose. Tuning into nature’s change of season, we can live our lives empowered through our own knowledge and the use of the ancient system of Ayurveda to restore and maintain balance in our minds and bodies, and as a result enjoy good health. Stretched thin? if your finances could use some flexibility, call us today. ALLOW YOURSELF SOME QUIET TIME WITH THESE MINDFUL GUIDES. Mindfulness: Diverse Perspectives on its Meaning, Origins, and Applications by J. Mark Williams and Jon Kabat-Zinn These two medical experts and renowned meditation leaders team up to provide a convergence of science, history, philosophy, and wisdom teachings. Contributors include such notables as Rupert Gethin, Christina Feldman, and Bikkhu Bodhi. Come B whatever you want to B. Just B You. How to Train a Wild Elephant by Jan Chozen Bays Chozan Bays, a physician and Zen teacher, offers a series of simple practices, reminders, and life lessons to help cultivate mindfulness in our daily lives. She’s also the author of the book Mindful Eating. 200 Hour Yoga Teacher’s Training Certification Making Space: Creating a Home Meditation Practice by Thich Nhat Hanh To ensure your mindfulness experience is never-ending, this respected Zen master extends a variety of methods to establish sanctuary in your living space. Parenting in the Present Moment: How to Stay Focused on What Really Matters by Carla Naumburg What really matters in parenting? This mother and social worker narrows it down to a few simple points, including connecting with children in meaningful ways and staying grounded. The Wisdom of No Escape and the Path of Loving-Kindness by Pema Chodron Buddhist teacher Chodron reminds us, “We are the sky. Everything else – is just the weather.” Peace is to acknowledge that the ups and downs of life are part of a true and enriching human experience. by Sue Patton Thoele Psychotherapist Thoele uses humor, understanding, and storytelling to connect with women and help them embrace mindfulness one moment at a time and enjoy the journey of personal growth. cardamom added a surprise bite of spice that countered the sweetness of the berries. Although the pancakes can be enjoyed alone, a dollop of cinnamon butter made with Earth Balance and maple-vanilla syrup certainly enhanced the exceptional flavor. Now, imagine washing this all down with one of Trumpet Blossom’s fresh juice specials —the orange-carrot-celeryginger combination being the latest one—or a morning cocktail like the heart beet martini: pickled beet martini with vodka, dry vermouth, and a salt-and-pepper rim. All the tastes were unique and cannot be found anywhere else since the dishes are made from scratch. This includes the slightly addictive homemade granola and yogurt, plump chocolate chip cookies, and the light yet satisfying chocolate cake with a hint of orange. Trumpet Blossom Cafe sets the tone for an after-work wind down or a casual first date thanks to the hint of a hipster vibe, live music on most weekends, and beautiful outdoor seating. Whether you eat a vegan diet regularly or not, this restaurant will satisfy your taste buds and solidify your Friday night plans. Feel clean and good. Here’s $20 toward your carpet cleaning service. We’re waiting for you at zerorezdesmoines.com/yoga. The Rolf Method is both technique & the art of connective tissue manipulation which realigns and rebalances the major segments of the body and releases chronic muscle tension and pain. Cultivating mindfulness during my yoga and meditation practice helps me become more mindful when I’m off the mat. When I practice mindfulness during my everyday life, I know I’m being a better version of myself; therefore, I truly believe it allows me to serve people in my life at a greater level, including offering them joy. Unlimited possibilities exist in which our mindfulness can exchange joy with others—from being an attentive cook and not leaving the kitchen a mess, which provides much joy for my husband, to being a mindful listener for a student, which adds ease and comfort that cultivate joyful experiences in the studio. joyful living, but enhances the worth that is within us all. In this way, mindfulness is a practice of honoring the light in every person, every place, every moment. I cannot really attest to how other persons receive joy through me, but I can be confident that my practice contributes to my joy. I am a more mindful and happy person with yoga, so I hope that is communicated to students and people in my environment. I know yoga really helps me be present with all others I am around at the moment. Mindfulness in my yoga practice has helped me cultivate more kindness to myself and increases my patience and joy in interacting with my family, clients, and the world at large. Taking time to slow down is so necessary. I have the good fortune of getting to share this concept with the expectant women that come to my classes. Mindfulness is one of the topics we cover when they take a mindful walk prior to asana. The shift of energy in the room is significant. I’m always surprised by the amount of women who share that they rarely (if ever) take this time for themselves. Being pregnant is a perfect time to soften and move more mindfully. It’s such a thrill to see this “aha moment” on their faces. I love helping mamas bring mindfulness more fully into their lives and give them this gift to share with their families. Please submit your questions for ‘Ask the Teacher’ to editors@yogaiowa.com. Discover your true spirit with a self practice. www.FitnessByDesignDM.com Where do you teach? I’ve taught privately for two years, and now have offerings at Santosha Yoga in Urbandale, Iowa. Let us guide you on your Fitness Journey! Favorite yoga pose Dvipada Pitham, or Bridge Pose. Visit our website for a Complimentary Class Pass for a Yoga, Strength, HIIT, or Pilates Mat class. It’s like dental floss for your back! Something you splurge on Good bourbon, a spunky manicure. One thing people don’t know about you I used to play honky-tonk piano in a melodrama house! What makes your style of teaching unique? I’m currently the only certified Viniyoga teacher in the Des Moines metro, and one of only three in Iowa. The Sanskrit word viniyoga means “appropriate application.” We are driven by function, not form. A yoga posture looks different on every individual, so we say, “Teach the practitioner, not the posture.” I’m committed to making the teachings of yoga available to those for whom the average, exercise-driven class is intimidating or utterly inaccessible. By using the movements of yoga to cultivate a relationship with one’s own breath, rather than as an end unto themselves, we unleash the deeper potential of a yoga practice—such as regulating physiological processes. If you weren’t teaching yoga, what would you be doing? I have sung professionally for many years. I always felt singing, at its best, reconnected people to a sense of their own humanity. With yoga, I feel I’ve stepped it up a notch, and rather seek to connect people to a sense of their own divinity. What inspires and motivates you? The ease yoga gives me in everyday life. On average, I work with forty individuals one-on-one in a given week between my yoga and music teaching. When my yoga practice is organized and consistent, I communicate and connect with each individual with much greater clarity, whether they are six or sixty. Additionally, I can find joy, or at a minimum, satisfaction, in tasks that I used to find taxing or tedious. Yoga doesn’t change my circumstances, but it decidedly changes how I interact with them. If I can offer people a fraction of that experience, I’ll consider my return-on-investment high. Patanjali’s yoga sutras, which defines yoga as “the state of mind where the constant fluctuations of the mind cease,” and the mind becomes “like a fortress.” In other words, the static in our heads gives way to a clear channel. Imagine being free of all those persistent little nagging voices, being able to find and define what’s of value to you, and then live by those values, rather than be a slave to your habits. And notice that nowhere in that definition is any mention of flexible hamstrings! The practice of yoga is a mental practice and the promise of practice is a clear head. Serving Indian, Caribbean and Mediterranean cuisine. • Gluten Free and Vegan available • Menu changes to fit seasonal vegetables Call to make a reservation or just walk-in! Tula is the best software in the world for independent yoga studios. From the yoga mat to everyday living, The Joy of Being Mindful issue celebrates greater mindfulness, awareness and caring for each other.